I’m busy trying to type my Advent Calender, but I still present to you the eighty third instalment of the Weekend Guess. 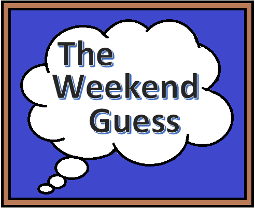 Leave your guesses in the comments below and I can see if my questions are too easy or too hard to figure out. I will give the correct answer with the next instalment. * Or: 21-year old boy becomes the Devil’s Bounty Hunter due to contract made by his parents prior to his birth.